The watch presented here is truly a unique watch in many ways. First, this model is the forefather of all the 24 hour watches subsequently produced by Raketa. 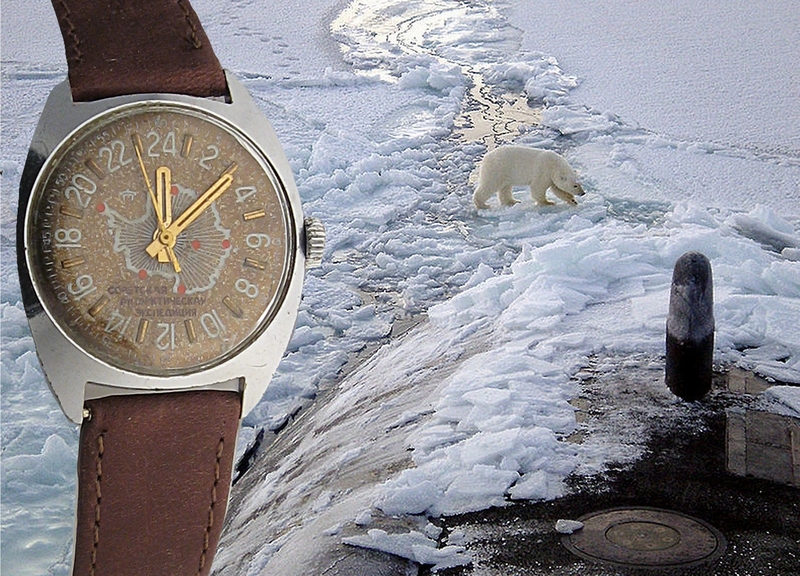 It is also the inspiration for all the non-Raketa 24 hour watches with a “Antarctic” theme (the 1st Moscow Watch Factory did make a “Arctic” model in the 1950s). Second, this is the only watch on this website which is not new but old, quite old in fact, and it shows. I have made no efforts to rejuvenate this watch as I find it far more interesting to see what it looks like after many years of wear and tear. Let me immediately say that even though it does not appear to ever have been cleaned it runs perfectly. Third, this is also the only watch on this website which is not Russian, but Soviet. Though my primary interest is in post-Soviet Russian 24 hour watches, this venerable forefather deserves to be shown here as the ancestor of all the other models featured here. Lastly, since this watch is different in so many ways from the other shown here, I have decided to let my son Alexei (11 – top) and my daughter Tatiana (15 – bottom) use their computer skills to design the photo collages shown here. Now, let’s turn to the watch itself. This Raketa was designed specifically for the Soviet Antarctic Expedition which was started in 1956 and which still exists today under its new name Russian Antarctic Expedition (which you can follow here, in Russian). You can see some original photos of the very first Soviet Antarctic Expedition here and check the history of the various Russian stations in the Antarctic here including the famous station Mirnyi, the first year-round polar station built deep inside the Antarctic landmass (1400km from the nearest shore!). The first Raketa Soviet Antartic Expedition were assembled in 1971, but the model here is one produced after 1980. The mechanism inside is the 2623H. This watch used to belong to an engineer who worked on the repair of Soviet Navy surface ships and submarines in the Russian far north. 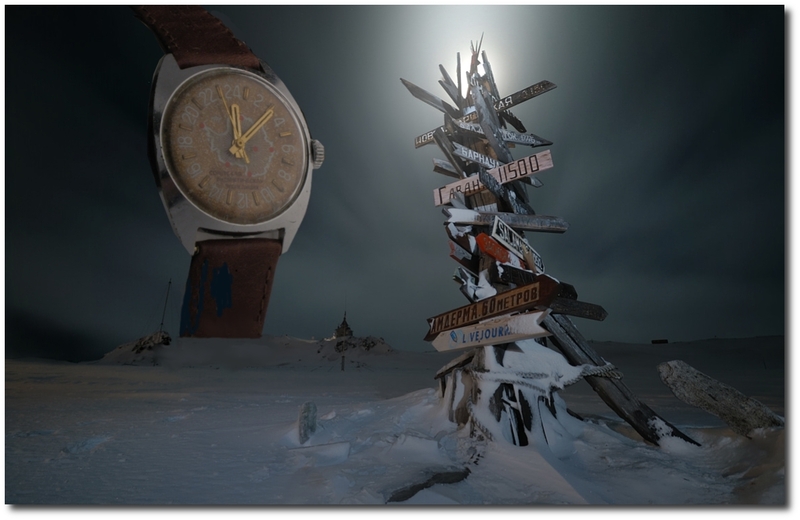 I think that the Raketa Soviet Antarctic Expedition truly embodies the spirit of Soviet and, now, Russian watchmaking: exploration, adventure, science and survival in extreme conditions. I also hope that it will continue to inspire Russian watchmakers for many years to come.